From True Tales From Burbank, which you may purchase by going here. 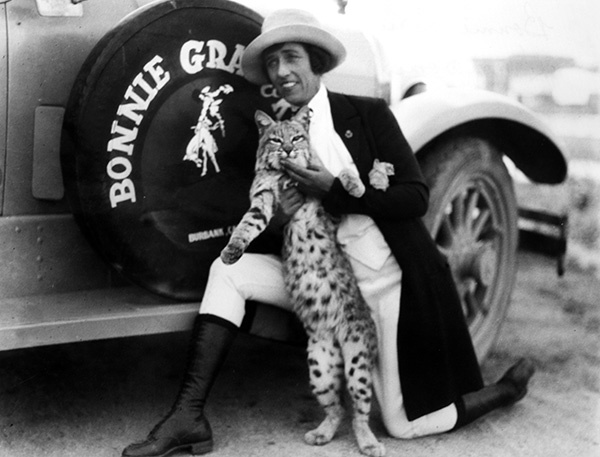 Burbank once numbered among its citizens an internationally recognized champion trick rider and rodeo star, Bonnie Jean Gray. 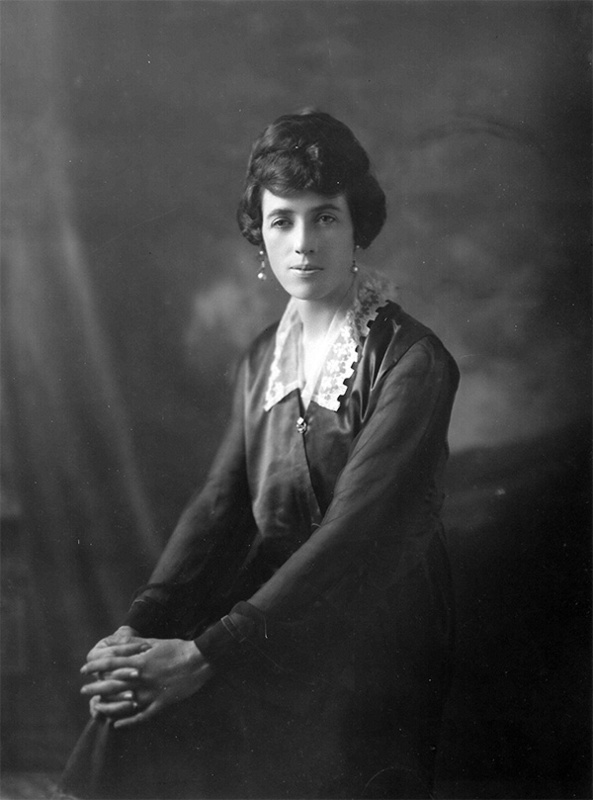 Born Verna Grace Smith in Kettle Falls, Washington, in 1891, she graduated from the University of Idaho at Moscow with a degree in music (she later did postgraduate work at the University of Chicago). While at the University of Idaho, she was the tri-state tennis champ. 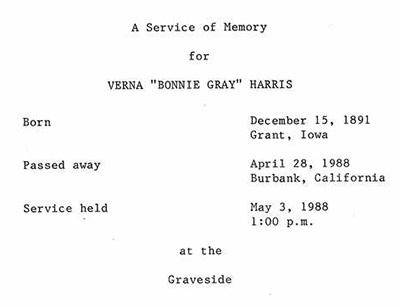 An accomplished pianist, Bonnie taught music for a short time. 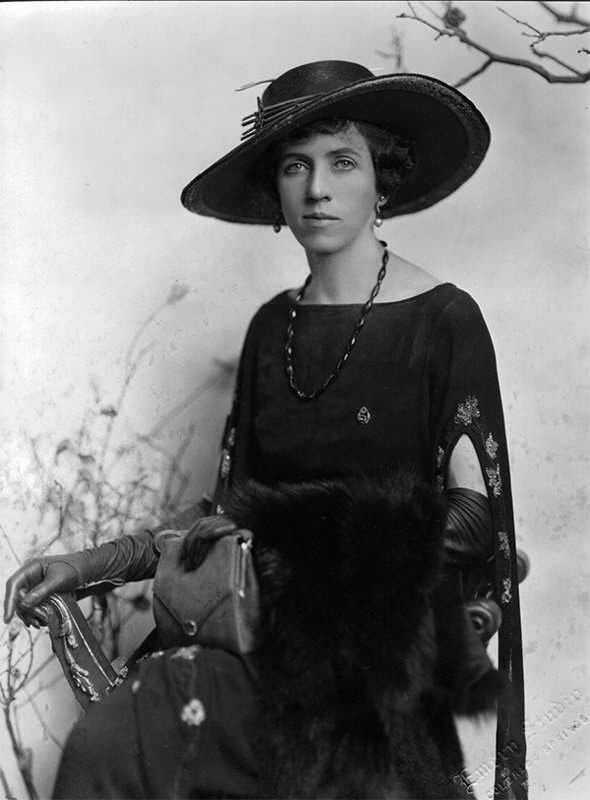 During World War I, she studied nursing at the U.S. Army’s Camp Lewis in Montana. While the 1918 influenza pandemic raged, she nursed hundreds of Apache Indians as a Red Cross volunteer on the reservation at Fort Apache, Arizona. Bonnie grew up around horses and took up rodeo and trick riding. She told her disapproving parents, “If one loves a thing and does it well, why shouldn’t she do it?” Tall and athletic in the saddle, astride her horse King Tut, her signature stunt in the 1920s and ’30s was to jump her horse over an open car containing passengers; she was also one of the first women to ride bulls in Mexican bullfights and, in 1922, was claimed to be the first woman to perform an “under the belly crawl” on a horse. 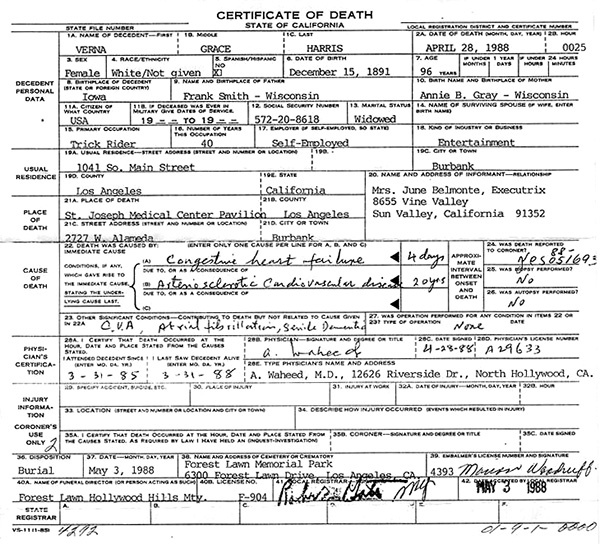 Her 1930 Los Angeles wedding to Burbanker and fellow trick rider Donald W. Harris was unique, as it was held with all one hundred people in the wedding party mounted on horseback—even the minister. Afterward, she and King Tut leapt a car in which her new husband and bridesmaid were seated. 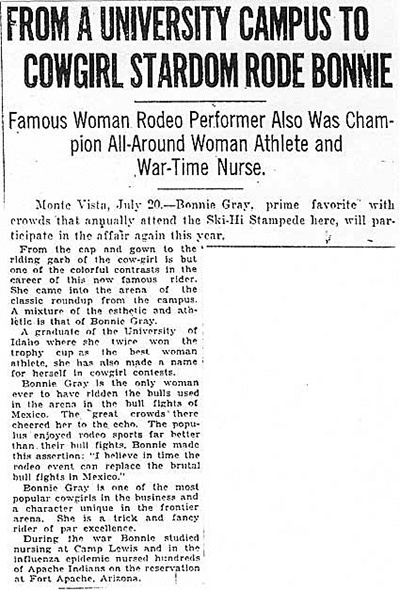 Bonnie Gray was a star performer in the Elks Club rodeos held in the early 1930s on the Jeffries Ranch property on the corner of Hollywood Way and Buena Vista Street. (James Jeffries was given a three-foot-diameter sombrero as a token of esteem for hosting the events.) She also performed in Mexico, Canada, the United Kingdom and Germany. Bonnie Gray’s later career included being a movie stuntwoman, doubling for such cowboy stars as Tim McCoy, Tom Mix, Hoot Gibson and Ken Maynard. She once earned $10,000 for a stunt involving jumping some brush and hurtling down a ten-foot cliff astride a horse; she fell backward, claiming afterward that she’d never do such a dangerous stunt again. Bonnie Gray’s Burbank ranch was located where the David Starr Jordan Middle School is located now. In fact, if archeologists ever dig up the playground, they’ll find the eight horses, two mules and numerous dogs, cats and other pets she had buried there. 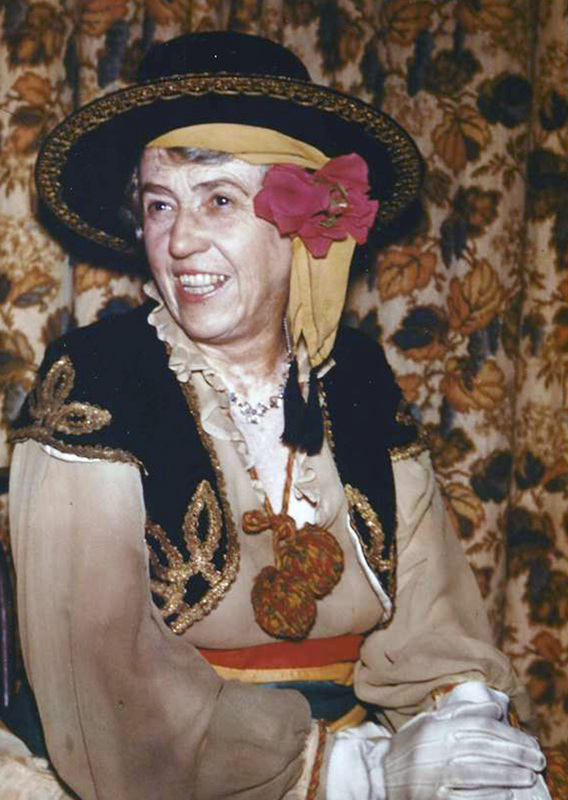 Gray died in Burbank in 1988, age ninety-seven. 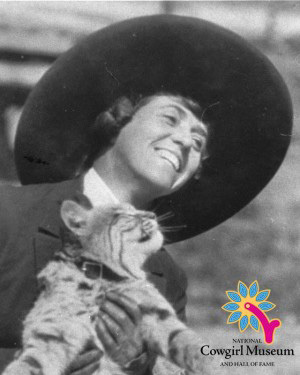 Her name and history are enshrined in the National Cowgirl Hall of Fame. “If one loves a thing and does it well, why shouldn’t she do it?” said Bonnie Gray to her disapproving family. Her parents had high hopes for their daughter, who had a college degree in music and was a fine pianist. 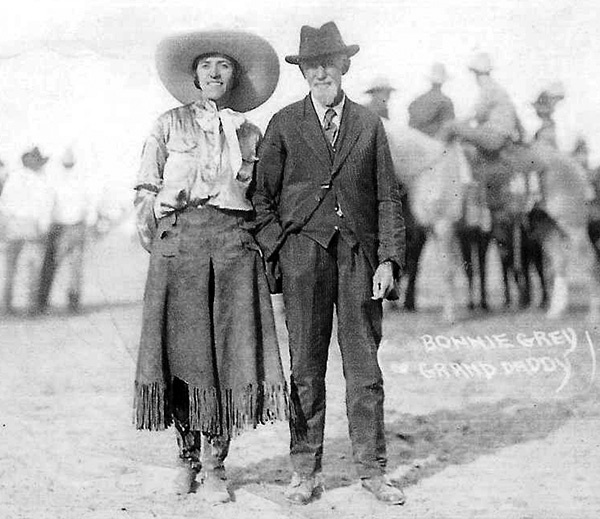 But Gray’s love for competitive sports lured her into the rodeo world of the Cheyenne Frontier Days, Oregon’s Pendelton Round-up, the Calgary Stampede, and New York’s Madison Square Garden. Some cowgirls did make reasonable amounts of money. 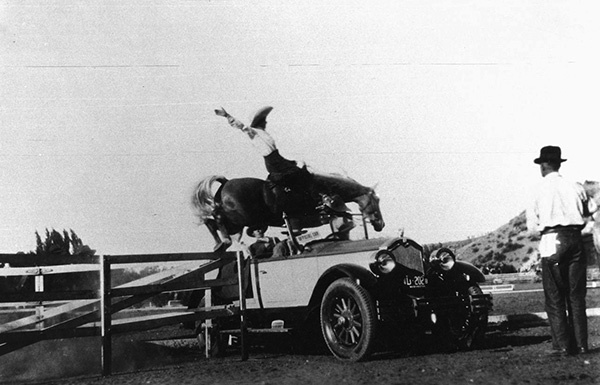 Bonnie Gray, who often substituted for cowboys Bing Crosby, Hoot Gibson, and Buck Jones, earned $10,000 for jumping a horse over a pile of brush and down a ten-foot cliff. The horse landed such that the stirrup straps broke and Gray sustained a backward fall. She commented that she would never do the stunt again, but few who knew her were convinced. “I used to ride to Beverly Hills and practice my stunts on Will’s (Will Rogers’s) front lawn," Gray said. 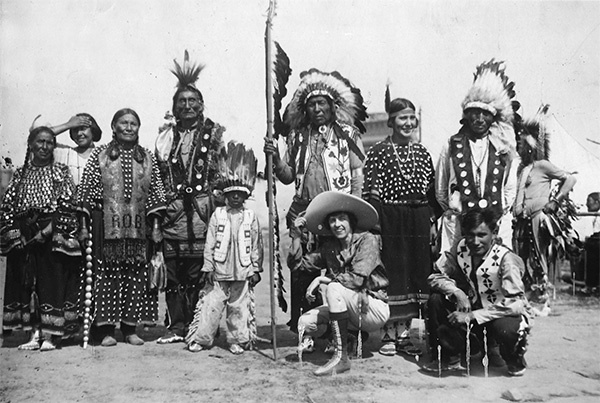 Bonnie and Native Americans, 1930s. Evelyn, Bonnie, Dwight, Anna B. 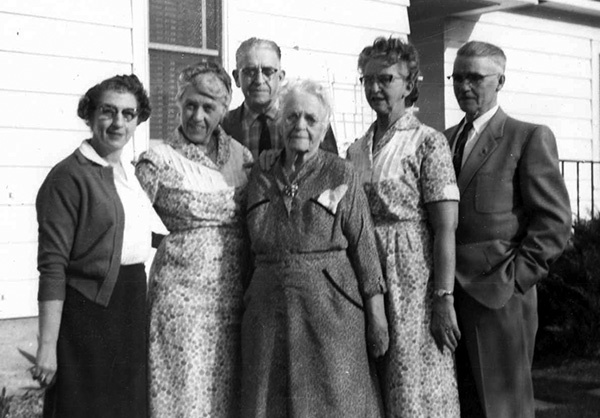 Gray Smith, Leila and Harry on the occasion of Anna's 90th Birthday in April 1959.